It has been a pleasure to see our boys and girls join the 5th generation of karate students! 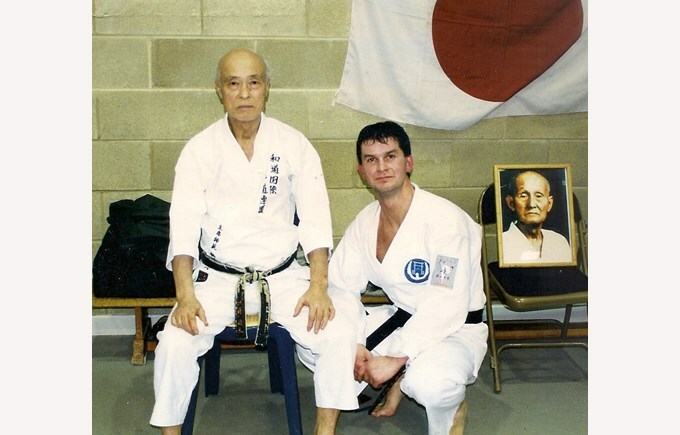 Mr Campbell and his teacher, Sensei Suzuki. In 1922, Gichin Funakoshi, the father of modern karate, was invited by the Emperor, to travel from Okinawa to the Japanese mainland, to give a demonstration. Hinonori Ohsuka became his student in Japan and he later developed the style, known throughout the world as Wado Ryu karate. One of Ohsuka's students, Tatsuo Suzuki, was one of three karate masters, sent out by the Japanese government in 1963, to promote karate in Europe. Sensei Suzuki, who passed away in 2011, was my teacher. It has been my privilege to offer the chance for the boys and girls in BSB Sanlitun, to join the fifth generation of karate students and they have been a pleasure to teach over the last two months, as part of the school’s After School Activity programme.